What is the link between our meat consumption, the cutting down of tropical rainforests in Latin America and the destruction of the Brazilian savannah? How much soy is imported into the European Union (EU) and Germany? Where does this soy come from and how large is the EU’s and Germany’s “land footprint” in those countries to satisfy our demand? 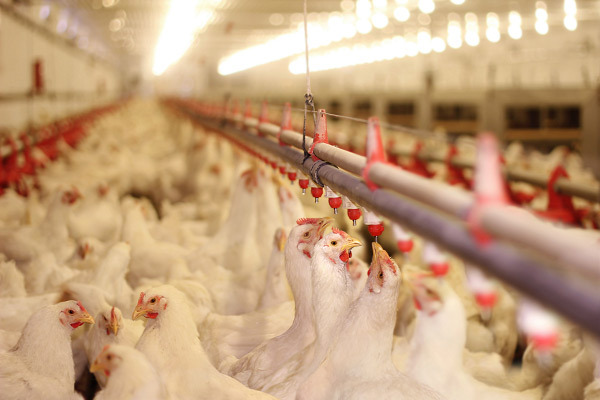 How much soy are we actually consuming when we are eating poultry, pork or other meat? What size is the “land footprint” of each German person eating an average amount of meat of approximately 60 kg per year? 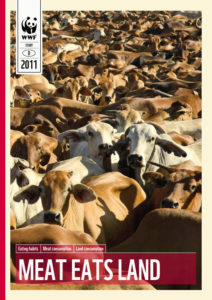 The Meat Eats Land study written for WWF Germany by Harald von Witzke (HFFA Research e.V. ), Steffen Noleppa (HFFA Research) and Inga Zhirkova, takes a closer look at these, and many other, questions based on the concept of “virtual agricultural land trade”. This concept analyses agricultural trade flows in the EU and Germany and converts them into land areas required for the production of the agricultural commodities in question, such as soymeal. According to this concept, the EU is evidently engaging in the large-scale virtual importation of land. In other words, the EU employs a large amount of land outside of its borders. In the 2008-2010 period, Germany’s share in this “virtual land trade” comprised almost 7 million ha, or almost 25 % of the total virtual land trade by the EU, which roughly equates to an area the size of Bavaria. Of these, 4.4 million ha were located in South America. In recent years, Germany’s contribution to the EU’s agricultural trade and virtual land trade has increased significantly. Germany’s own agricultural area comprises approximately 17 million ha. Given a virtual land grab of 7 million ha, this means that Germany utilizes additional land outside of the EU equating to more than 40 % of its own agricultural land base. One agricultural commodity is particularly responsible: 40 % of Germany’s virtual land grab is caused by the production of soybeans alone. Most of the imported soy is used as feed in livestock production. Compared to 1950, meat consumption has doubled – and it has even quadrupled compared to 1850. At the same time, alternative protein sources such as pulses have largely been pushed aside. Instead, the average person today consumes around 56 kg of pork, 19 kg of poultry, 13 kg of beef and 1 kg of sheep meat per year. Consequently, the “production footprint” caused by this diet stands at more than 1.000 m² per person per year. For the German population in total this footprint amounts to more than 8 million ha, or more than 50% of the agricultural area available in Germany. The authors conclude that the production of soy as animal feed results in a high land use footprint and associated negative environmental effects, such as the destruction of natural habitats and loss of global biodiversity. Further research is needed on eating habits and their successive modification. Studies considering the implications of eating habits on virtual land trade are intended in the future (see our other studies on this topic: Tons for the Trash, From Farm to Fork, Climate Change on your Plate).